RADAR Festival has launched, announcing its first wave of bands for the inaugural edition. The festival is to be held in Guildford, Surrey, on 2-3rd August in a brand new venue. The first announcement sets the tone of the festival for future years and marks this new event's ambition. 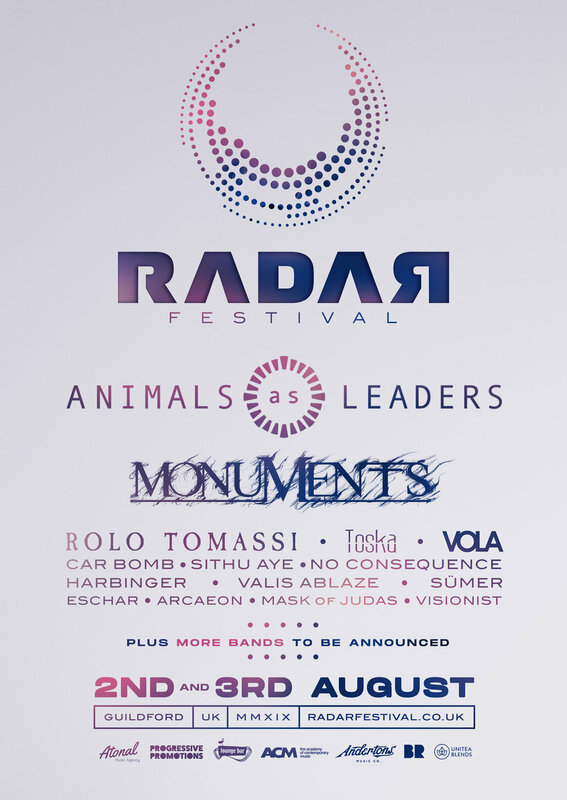 ANIMALS AS LEADERS are the first announced headliners, with MONUMENTS and ROLO TOMASSI, TOSKA, and more. *back for one night only. With their mixture of international talent and confirmed homegrown success, RADAR Festival will position themselves as champions of forward-thinking guitar-led music. The brainchild of two promoters in the South of England, RADAR will be held over two stages at a new indoor location in Guildford, half an hour from London. Focusing on bands who push boundaries across the musical spectrum, RADAR will become a high-point on the UK festival calendar, and a new community for all fans of sonic innovation.